Burlington Signs National can also do large format digital printing. 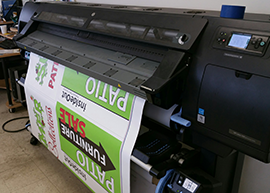 We can print in house up to 60″ wide with no seams. Our printing system and cutting technology allows endless outdoor and indoor graphic capabilities. We use environmentally friendly inks and a variety of print media for different applications. We laminate our digital prints for outdoors. This increases the longevity of the vibrant colours. Plan your event or impress the crowd with eye-catching signs. Digitally printed banners and custom trade show displays will impress viewers and draw them towards your business. With quick turnaround times you can be sure you will be pleased with the outcome.